Amen Corner Returns to Plaza for 'Smoke on the Mountain'. ANDREW GUZMAN (Dennis Sanders) Andrew Guzman is very happy to be back on the Plaza stage for this wonderful show. His past Plaza shows include SMOKE ON THE MOUNTAIN where he played Dennis, ALL SHOOK UP where he played Dean Hyde, THE MUSIC MAN where he played Jaycee Squires, SINGIN' IN THE RAIN and AIDA. He would like to thank his family and friends for all their support. "Thanks guys. I know, I appreciate it." P.S. "I win, A.R.H." CAMILLE SHAW (June Sanders) is all "aflutter" to be back at Plaza Theatre Co! She was last seen as the very pregnant June Sanders in SMOKE ON THE MOUNTAIN HOMECOMING. Some of Camille's favorite parts have been Sylvia in SYLVIA, Sabrina in SABRINA FAIR, Florence in MAN WITH THE POINTED TOES and CURIOUS SAVAGE...plus so many more. Thanks to My Love!!!! DARCY FARRINGTON (Vera Sanders) is so very excited to be back at PCT after a year hiatus. I’ve missed you so! Previous favorite roles at PTC include Sylvia (ALL SHOOK UP), Muzzy (THOROUGHLY MODERN MILLY), Miriam (BEAU JEST), Janet (KISS & TELL), Abby Brewster (ARSENIC & OLD LACE), Miss Skillon (SEE HOW THEY RUN), Verna (GHOST OF A CHANCE) and Vi (FOOTLOOSE). Other favorite rolls include Miss Hannigan (ANNIE), Golde (FIDDLER ON THE ROOF), Aunt Eller (OKLAHOMA) and various in LUCKY STIFF. Past experience includes director, choreographer, vocal coach, percussionist and live sound engineer. Darcy is a worship team member at her church and also enjoys working her day job in the financial planning arena. Thanks to the Lord for allowing me to use my gifts and talents alongside such a great community of people, to my brand new boys Robby & Anthony for learning to love Plaza as much as I do, and to JaceSon, Aaron, Tina & Milette: I love you guys. Thanks for letting me be a part of your dream. JACESON P. BARRUS (Stanley Sanders, Director) As a co-founding producer of PlazaCo JaceSon has been more onstage than not. Most recently on stage as the orderly Wilson in HARVEY and as Farleigh in THE SCARLET PIMPERNEL which he also co-directed with his wife Tina. He's also enjoyed playing Will Rogers in WILL ROGERS FOLLIES, Cinderella's Prince in INTO THE WOODS and recently as Frank Butler in ANNIE GET YOUR GUN opposite the amazing Daron Cockerell. JaceSon just won a Column Award for Best Original Work for last season's A CHRISTMAS CAROL. When he's not at the theatre, JaceSon loves spoiling his 6 terrific children, watching classic movies and writing the occasional poem. JONATHAN METTING (Rev. Mervyn Oglethorpe) Previously seen at Plaza as Joseph in JOSEPH...DREAMCOAT, Cornelius in HELLO DOLLY, Tommy in ANNIE GET YOUR GUN, and Ozzy in THE SCARLET PIMPERNEL. Past favorite roles include: Huck in BIG RIVER, Freddy in MY FAIR LADY, Charlie in GOOD MAN...CHARLIE BROWN, Dickon in SECRET GARDEN, Barnaby in HELLO DOLLY, Barrett in TITANIC, Man 1 in SONGS FOR A NEW WORLD, Younger Brother in RAGTIME, Gary/Roger in NOISES OFF, Happy in DEATH OF A SALESMAN, Laurie in LITTLE WOMEN, John the Baptist/Judas in GODSPELL, Armand in THE SCARLET PIMPERNEL, and Bob Cratchit in A CHRISTMAS CAROL. "Thanks Mom, Dad and little 'P' for putting up with my sometimes crazy schedule." KASI HOLLOWELL (Denise Sanders) is delighted to be a part of this adorable show. She was most recently seen dancing on the Plaza stage in JOSEPH...DREAMCOAT as Potifar's Wife, ANNIE GET YOUR GUN and HELLO, DOLLY. Some favorite roles include Ariel Moore in FOOTLOOSE at PlazaCo, Mrs. Meers in THOROUGHLY MODERN MILLIE, Dorothy in OZ! and Thea in SPRING AWAKENING: A...TRAGEDY. Kasi enjoys teaching Musical Theatre at Studio C Dance in Burleson. "Kudos and thanks to JaceSon and Cherie for all your hard work and my ever fabulous double, Tabitha. My love to Mom, Dad, JoJo, Michael and Sarah." KEVIN POOLE (Burl Sanders) This is Kevin’s sixth Plaza production as an actor and/or director. Kevin was last seen onstage as Link Hansen in THE MAN WITH THE POINTED TOES and is scheduled to direct ARSENIC AND OLD LACE next Fall. 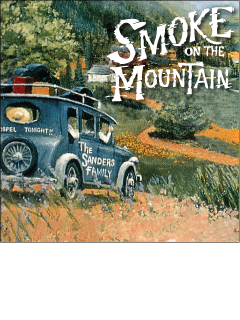 SMOKE ON THE MOUNTAIN is dear to him because he grew up singing many of these songs around a piano with his own family. He can relate to the characters in this show because he has been an unsure and nervous “Dennis”, a lost and wayward “Stanley”, and is now busily occupying himself as a “Burl”, who is just trying to be a good man for his family. As I spend time here with my onstage family, I am reminded how precious my real family is and how utterly meaningless all this would be without them. To all our patrons. I hope you enjoy the warmth and humor in which this Gospel story is presented. PARKER BARRUS (Dennis Sanders) Parker has been in a few shows here at Plaza. You may remember him as Frank Gilbreth in CHEAPER BY THE DOZEN, as Raymond in KISS AND TELL, as The Washing Machine in CASH ON DELIVERY, Fredrich in SOUND OF MUSIC, Colin in THE SECRET GARDEN and as Benjamin on JOSEPH. He also played Ruby Sideburns in the Lolly-Pup's Roundup show BLACKBEARDS BIRTHDAY BASH. Park is an inventor (better keep an eye on the blue tape) and a professional big brother. He sends loves to Tabi, Cam, Edie, Mimi, and JJ. TABITHA BARRUS (Denise Sanders) Tabitha is always ECSTATIC to play on the plaza stage, and is glad she devoted her entire summer to Joseph. Favorite roles include Little Red in INTO THE WOODS, Anne Gilbreth in CHEAPER BY THE DOZEN, and Minnie Fay in HELLO, DOLLY! Choreography credits include Plaza's THE MUSIC MAN, HIGH SCHOOL MUSICAL and JOSEPH...DREAMCOAT as well as several numbers for Travis Academy of Fine Art's Musical Extravaganza. Tabi will be a senior at TAFA, and is looking forward to studying the performing arts when she attends college next fall. She was thrilled to receive two Column awards this spring, the Chita Rivera dance award and the Ben Bretell youth award. Tabi sends love to mum and pop, Park, Cam, Edie, Mimi, and JJ. "To God be the glory!" BOB GRACEY (Cousin Buford, Bass) Is quite happy to have been asked to accompany the "Smoke" cast again on the bass. Originally from Rochester, New York but moved to Texas to attend optometry school in Houston. Has played bass and cello for the Brazos Chamber Orchestra and playing for the Mission band at First Baptist Church. During the day, For the past twenty years, he has been examining eyes at Texas State Optical. Wife JoAnn, teaches theater at Alvarado high school. Has two kids, Andrew who just graduated from Colorado School of Mines (YAY!) and Chris who will be a senior at Sewanee in Tennessee. "Has been a lot of fun to play along with so many talented singers and actors." HOWARD GEISEL (Fiddlin' Forrest) Howard Geisel – Howard has played Fiddlin’ Forrest multiple times, and finds it fun to be playing him again. He is an elementary music teacher in Arlington, and teaches private violin lessons after school. He also plays on his church’s worship team. He also enjoys tracing his family’s geneology – and is thankful that, as of yet, no skeletons have been uncovered in the family closet. Howard would like to thank the Lord for His gifts – Plaza for a place to use them, and his family – Taffy, Joey and Caroline, for being the music that undergirds his days. STEPHEN SINGLETON (Pete the Pianst) This is Stephen's eleventh appearance at Plaza and he's thrilled to be involved another show yet again. Stephen has appeared in many Plaza shows, where he was last seen in the dance corp of JOSEPH...DREAMCOAT and before that Barnaby Tucker in HELLO DOLLY! Some of his favorite roles are Snowboy in WEST SIDE STORY, and Rolfe in THE SOUND OF MUSIC, and Daniel in 7 BRIDES for 7 BOTHERS. Stephen enjoys playing guitar, piano, violin, singing, dancing and tumbling. Thank you to my friends and my family, who encourages me; and to Jesus Christ, who loves me. To Him be the glory in all that I do. CORLIS CORNILS (Maude) This is Corlis’ first speaking role at Plaza. Her past performances have been at Carnegie Players IT’S A WONDERFUL LIFE, as Aunt Tillie, and TO KILL A MOCKINGBIRD, as Mrs. Dubose. In her spare time, she loves to hang out with her wonderfully talented husband, Jay, travel (especially to Colorado ), putter in the yard, and keep up with the demands of her two cats. She wishes to thank her sweet husband for the encouragement and direction he gives her. God has blessed her beyond measure and she can truly say…. "It’s a Wonderful Life"! JUDY 'GIGI' BARNETT (Maude) feels privileged to be a part of Plaza Theatre’s third presentation of SMOKE ON THE MOUNTAIN. Judy enjoys all aspects of community theatre. Onstage as an actor in SMOKE ON THE MOUNTAIN, SANDERS FAMILY CHRISTMAS, SMOKE ON THE MOUNTAIN HOMECOMING, SINGING IN THE RAIN, SOUND OF MUSIC; or behind the scenes, as producer, asst. director, or sound tech in productions of TO KILL A MOCKINGBIRD, DRACULA, OLIVER, LION WITCH AND WARDROBE, MY FAIR LADY; and as a volunteer making popcorn in concessions. She has volunteered with Plaza Theatre Company and Carnegie Players Theatre since 2007. Judy is a native of Cleburne and a graduate of Cleburne High School many, many years ago. She wishes to thank her husband, Dale, family, and friends for their steadfast encouragement and support. TAFFY GEISEL (Myrtle) Taffy is tickled to be playing Miss Myrtle. She has played her so many times that Myrtle feels like a second cousin twice removed. You may also remember her in KISS AND TELL, and she had great fun being the Director of Plaza’s SINGING’ IN THE RAIN. Along with her son Joey, Taffy just finished writing and producing a brand new musical version of ANNE OF GREEN GABLES, at Artisan Center Theater. Wow, was that fun! And wow, is she tired! Favorite shows she has directed include BEAUTY AND THE BEAST, THE MIRACLE WORKER, GODSPELL, SOUTH PACIFIC, PRINCE CASPIAN, ANNIE, and THE LION… WARDROBE, for which she was nominated for a Column Award for Best Director. She is looking forward to her next project – directing ANNIE here at Plaza later this year. Taffy is thankful to her great and mighty Lord, who is the giver of every good gift. Thanks to Barrus and Silers for believing in family friendly theater, to friends who pray, and to Howard, Joey and Caroline, who enable her to soar.